Saturday morning had the most brilliant sunrise. I love when I'm outside expecting nothing exciting and then - I see beauty from Mother Nature. 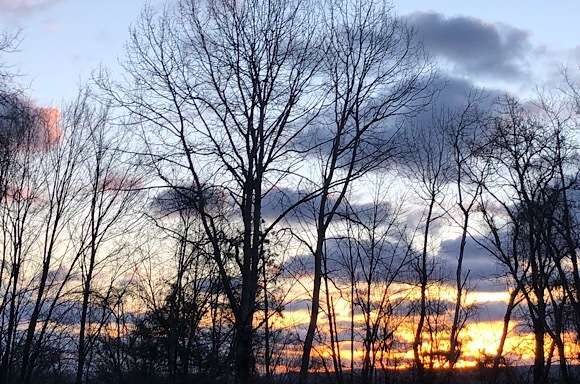 Have you noticed the longer days? Daylight starting earlier and ending later. These little bits of changes uplift me. I am on the second sleeve! Saturday night we attended the evening Mass. We were graced with free entertainment with a family of three children under the age of 5 yo. Oh boy! They were squirmy, wiggly and active. The middle girl was laying on the floor half in and out of the pew. I guess the homily was a little too much for her, ha! When Mass ended, I was exhausted and could not remember the homily much. Kids! bought this hand made wall quilt for 50 cents- score! Today was the usual chores and not leaving the house. Well, we did take a walk with Frodo but it was quite chilly and I could not wait to get back home. I was bundled from head to toe and was still chilled down to my bones. I finished reading The Great Alone and do not recommend the book. The plot was all over the place and sometimes fantastical. Her other book, The Nightingale, is way way way better, read that one. We had pizza yesterday and today. 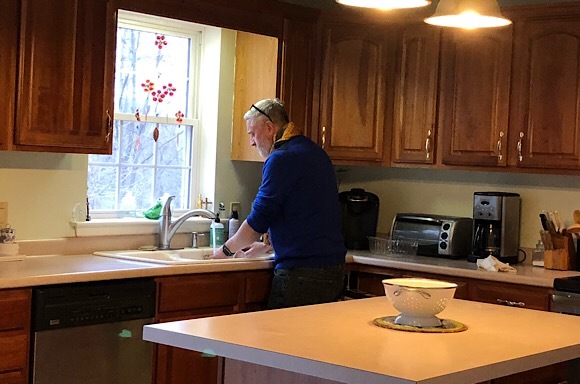 My husband did the dishes which I love. He does a much better job than I do. With just the two of us, I wash by hand instead of using the dishwasher. Don't forget I don't cook for three of the days, we either eat out or have left overs. I still cannot cook for two, I'm set to cook for four people. The snowman patchwork was a score! Keep warm. My weekend was full of cooking! I made ziti, meatloaf, mac and cheese, lasagna, and brownies for my niece. When I had my children, my MiL made and brought over food for about two weeks. It was lovely as that meant I could just focus on babies and didn't have to cook. I'll always remember it as one of the nicest things she did for me. My niece just had her third child and I wanted to carry on the tradition. I have tried to cook but friends and family keep inviting us over to eat. It is nice but I enjoy cooking too. Tonight I am making hot wings and sweet potato fries (from scratch). It is so hard to cook for two. We have been empty nesters for 22 years and I still have issues with it too. We went to Mass last night also. There were so many little ones there. I always smile when I hear one of them say "Is it over with yet?" It is so hard to sit still for an hour. Especially when you are 3 years old. But the fact we have those children at Mass means the church will continue on! Our Priest told us to put the children in the front row and if need be, bring pencils and paper or even books for them to go through during mass. We did that with our Grand Daughter and God Son and they both were very well behaved since they could see what was going on. Plus we explained things to them as the mass proceeded from one part to the next. It was a good weekend here, and ending with some snowfall! I really love how clean it makes everything look. My husband complimented me on the table runner I have on our dining room table. And then he asked if I was actually asking for snow by making a snowman table runner?!! LOL. Yes, we got more today. And maybe more tomorrow! Wow, that snowman was a steal! My husband does most of the dishes. I do the cooking when I'm not working, but during the school year he does it. He doesn't love cooking, so we have pretty basic food much of the time. 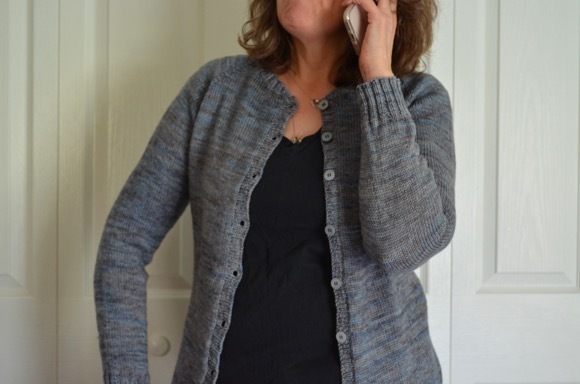 I have done a lot of knitting and sewing this weekend. I was supposed to go on a big walk with friends, but the city is an ice rink this weekend (not on purpose) -- terrible for walking. What a gorgeous sunrise picture! We had such a busy weekend. My daughter was home from college and my son had a Rubik’s cube competition plus a basketball game. I’ve made a meal plan for the week. Bad weather usually motivates me to have food in the house I can cook. I’m a bit tired and there’s still a load of laundry to fold. 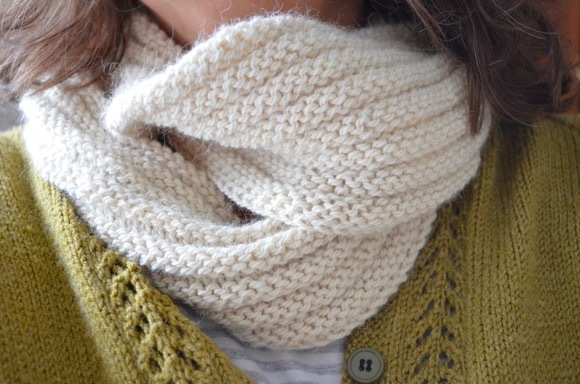 I’m ready to sit and knit. 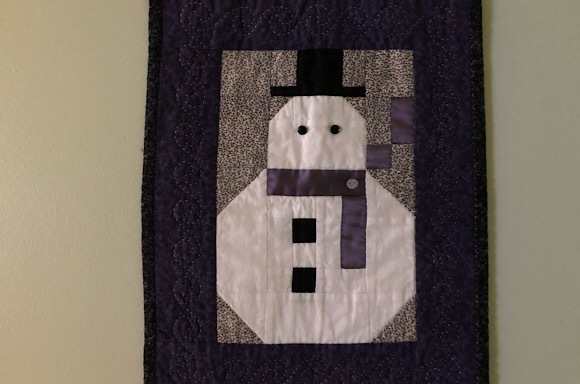 The little snowman quilt is adorable. i love when i start noticing the changing of the seasons. here i notice the mornings. it may be because i am awake way before the rest of the house. i tend to open curtains and windows to let in the morning air - and its getting darker here. i have noticed this for a few weeks now. autumn is on its way. I love that you had wiggly little ones in the pew in front of you at church...they were your homily! Pizza two days in a row? You are my kind of people! I had a day like you did yesterday. It was beautiful out so I did a bit of weeding and trimming, math with Little B and a tiny bit of paperwork. It was nice to be home. Your weekend sounds peaceful and lovely. Mylo and I went for several walks. I do not like winter, but I have enjoyed putting on layers of wool, boots that stay warm, hats and mitts that keep the extremities warm, and tromping out into several inches of snow to play and walk. I feel in touch with the seasons and my surroundings. There is no use to fight it as the weather always wins, so I embrace it as I can. Sounds like a lovely weekend (especially with someone else doing dishes - lol). We got some snow overnight but it is light and powdery...tonight sleet and freezing rain are forecast...not looking forward to that! Like you, I enjoyed The Nightingale...I did not like The Great Alone and only read about 75 pages or so before returning it. Sounds like a lovely weekend. What a great find, the snowman and at such a great price. Oh! That snowman is adorable! I love the dishwasher for the utensils but I'll happily hand wash the plates and cups. Drying the dishes and putting them away however.... that's a whole other matter. That kind of snowman I like! We've been snowed in here as our hills make driving very scary. Some one was stuck for hours in our n'bors' driveway; luckily they aren't there so didn't need to go out. We had someone who had to be towed from in front of our house as they were a perfect target for cars trying the hill. Now they are predicting rain which should make it very interesting. It was very nice to see your sunrise photo!!! Yes! It's so nice to wake up to sun instead of it looking like it's still 3 am. What a lovely, first photo. That snowman quilt is super cute. Yeah, I always am entertained by my brother's three kids. I don't miss those ages and just laugh and laugh. We spent most of Sunday a family of 3 butts on the couch. (I did exercise earlier in the day but I was the only one.) We have been uninspired in the kitchen and exhausted so we have been living on take out the past 4 days. We have no regrets that we are fortunate to do this. I think not only did the past week exhaust us, but we know this week is going to be another humdinger. Rest when you can, and dig deep when you can't, I suppose. Mr. Snowman is super cute. My younger friends would roll their eyes at my weekend if I told them what I did. It was calm, full of crafting and Hulu. 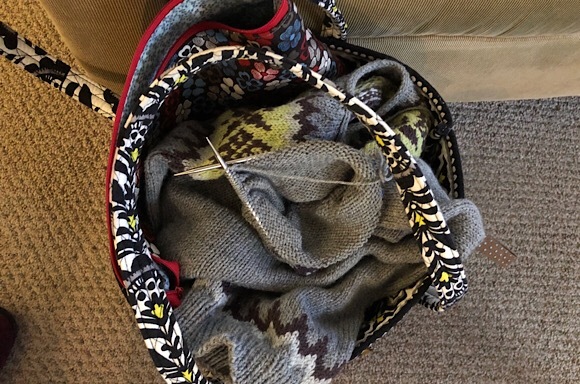 I played couch potato while knitting without guilt. I contemplated cooking a casserole but was unable to leave the knitting needles. That is a brilliant sunrise and at 50 cents who wouldn't walk past that snowman ! Happy upcoming weekend by the way. My husband can't do anything in the kitchen But he's good with the kids.. so he takes over the bed time routine while I clean up.